Plans to leave a "golden" economic legacy from Glasgow's 2014 Commonwealth Games are "under real threat" because of funding cuts, it has been claimed. Clyde Gateway said cash earmarked for it, and five other urban regeneration companies, was being slashed by 46%. It claims this will jeopardise redevelopment plans for Glasgow's east end which will be home to the games. Fund givers Scottish Enterprise said it had had to look closely at future priorities. Clyde Gateway is one of six urban regeneration firms in Scotland charged with delivering "focused, integrated strategies" to turn around run-down communities. All six receive funding from the Scottish government and its main economic development agency, Scottish Enterprise. Clyde Gateway said it had been given "a ballpark figure of just over £18m as a combined level of support for 2011/12 from the Scottish government and Scottish Enterprise but no indication of support for 2012 and beyond". It claimed Scottish Enterprise had made a 46% cut in support to all six urban regeneration firms in 2011/12. The agency said that it had been "anticipating" £7.5m from Scottish Enterprise on the basis of a "legal agreement" but had now been told it would share £6.8m with the other five urban regeneration firms. In a statement, Clyde Gateway said: "We now have less resources that we had been led to believe from previous discussions and from statements made by government ministers that Clyde Gateway was a national priority given the nature of our work and our efforts to assist with the delivery of a true legacy from the 2014 Commonwealth Games. "As such, it is going to be a huge challenge to maintain the momentum we have built up over the last three years and it will also be tremendously difficult to plan ahead for meaningful long-term regeneration and development. "We are currently looking at the different options open to us, but it would be accurate to say that some of the longer-term economic development projects we saw as being key to success are in jeopardy." Clyde Gateway's Jim Clark said that the funding indicated by Scottish Enterprise amounted to "a substantial cut". He told BBC News Online Scotland: "While the Commonwealth Games and main venues are not in any danger, the legacy from the games is, with many of the regeneration goals in Glasgow's east end under real threat." Mr Clark said proposals to bring derelict sites into use and make the area around the M74 extension more attractive were now in jeopardy. A spokeswoman for Scottish Enterprise said: "In common with all other public sector organisations, we have had to look closely at our priorities for next year to ensure that we're investing in those areas that will have the biggest impact possible on Scotland's economic performance. "The Glasgow Commonwealth Games in 2014 offers enormous opportunities and we recognise that we need to invest now if we are to fully exploit these opportunities for the benefit of Scotland. "In recognition of this and of the important contribution that urban regeneration companies make to the Scottish economy, we have agreed to invest £6.8m to support their activity in 2011/12. "This is in addition to funding from the Scottish government and the combined investment will ensure that they have access to more than £25m in 2011/12." 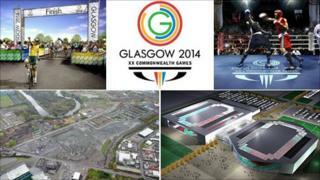 Can 2014 Glasgow Games have a lasting legacy?